Here’s metal more attractive – with a patina of rust! There’s something rather attractive about the colours and textures of rust. It adds a warmth and interest to metal objects, and although it can be destructive, it’s also rather lovely. Rust, that is iron oxide, often has flakes and crusty layers in a complex mix of shades, as the process involves both oxygen and water reacting with the iron. This mooring bollard almost glows from the inside, and some of the iron oxide has washed down to flow across the concrete dock. You can imagine the number of storms that hit this southern shore in winter, and see the effects on this crusty old lump of iron. The red of the iron oxide against the turquoise of the sea is a wonderful combination! 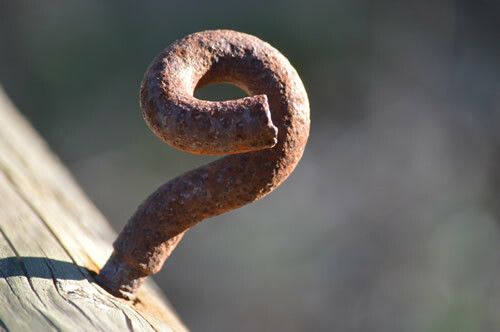 This small hook, seen in a field on the Stari Grad Plain, is such a pleasing shape, in addition to having that interesting pock-marked rusty patina. In English, it’s clear that rust, russet and red are related words, and in Croatian, hrđa or rđa may actually derive from the same ancient origin. 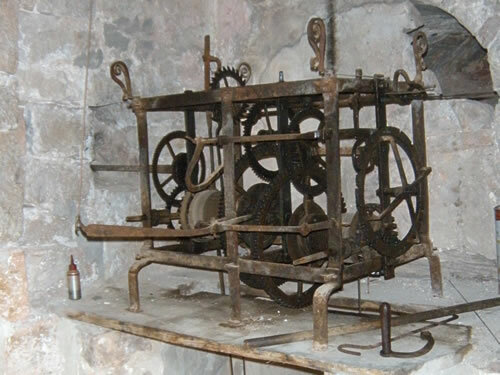 The church clock in Malo Grablje is stopped at 12 noon (or is it midnight?). This picturesque little village has been deserted since the 1960s – all except for the village inn, which continues to serve very tasty meals for visitors. 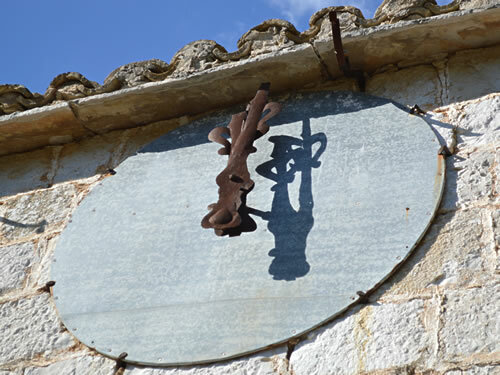 And down in Vrboska, the clock on Sv Marija chimes the hours throughout the day and night. That’s the large fortress-church that I call the clock at the end of our street! It keeps pretty good time, thanks to this old cast-iron mechanism and a very long pendulum. 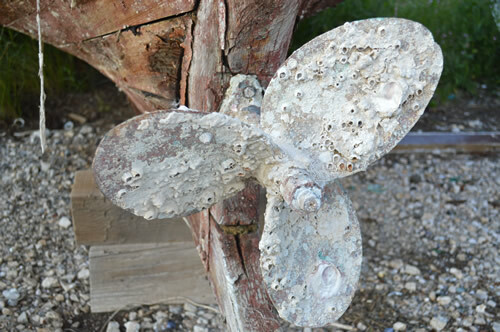 Now, this propeller isn’t so much rusting as turning into a coral reef! This old boat on the shore in Vrboska is sadly no longer being cared for, and has clearly been left in the water for some time. Meanwhile, this boat in dry-dock is being scraped and repainted. 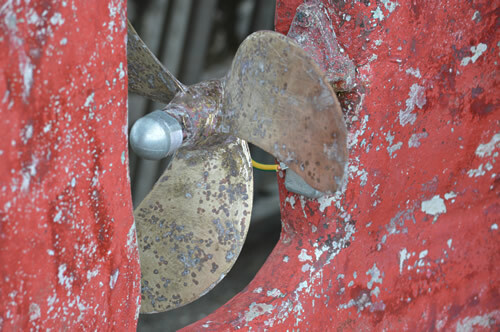 This propeller is in much better shape, though it still has a rather interesting patina. This propeller looks to be brass, so the reddish stains here will be copper. 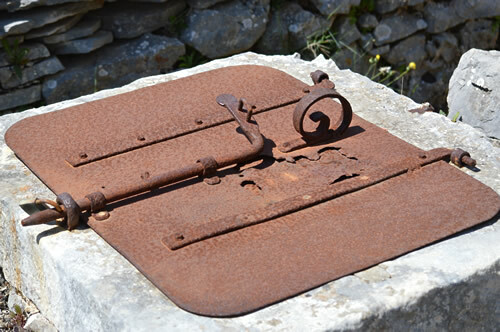 This solid metal lid for a water cistern in Humac is a great design. Not only can it be bolted and locked (useful since this is outside), but the curly spring acts as a support once the lid is open. 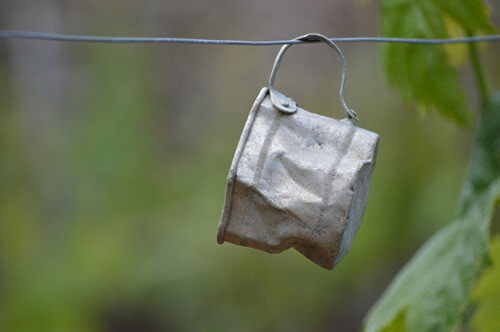 Also in Humac, this little tin cup was hanging from a wire around a vineyard. Is this some form of scarecrow to keep birds away from the fruit, maybe? It’s certainly been around for a long time, by the looks of it! 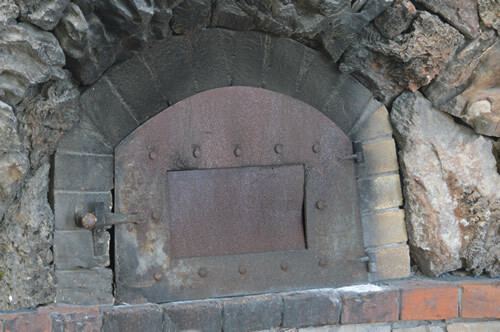 This very fine oven door is in the kitchen of the Konoba in Humac. No electricity or gas here, solid fuel cooking only for some very tasty meals! 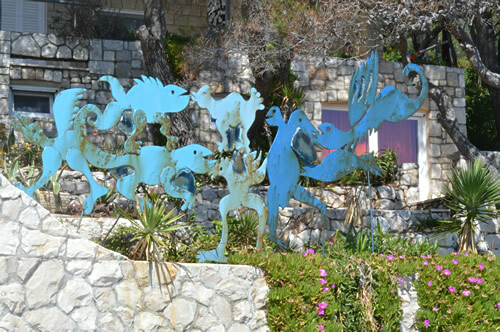 Sometimes, we have metal intentionally as artwork, as here in this lovely sculpture in the garden at Villa Meneghello in Hvar. I’m afraid I don’t know the artist, but it’s a very lively addition to the neighbourhood! 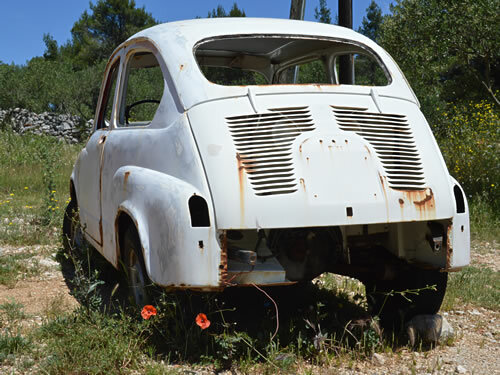 A rather different form of metal art – maybe titled “Rustbucket with Poppies”? This old car has been left in a field near Vrboska to rust away. Shame, as it doesn’t actually look in that bad condition. I’ve seen worse on the roads! 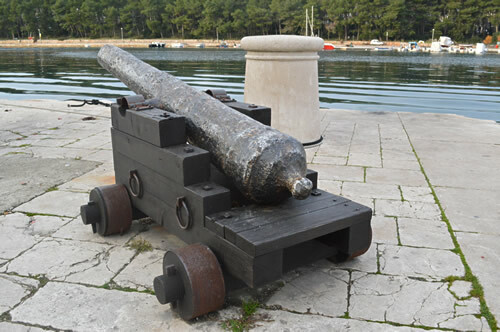 Stari Grad’s beautiful new Riva has a feature cannon! Nicely polished, too. I guess you have to work hard at keeping your cannon in working order. 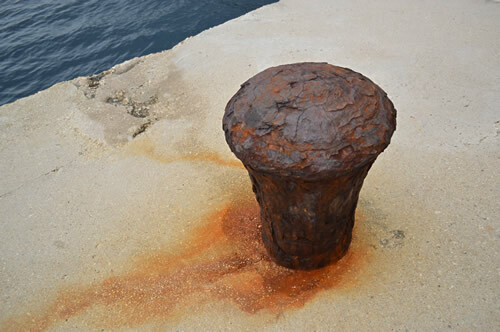 Roman historian Pliny the Elder suggested that the formation of rust was a natural balance imposed by the gods to limit the destructive power of iron weapons. Nice thought. 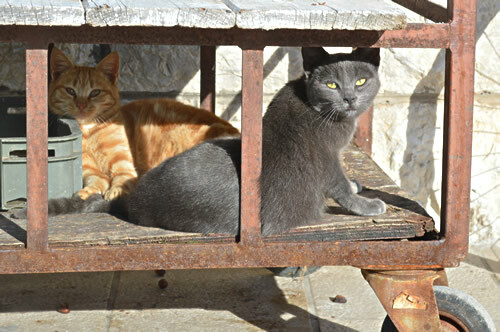 And finally, this rusty old cart in Jelsa made a handy snoozing place for this rather lovely pair of troublemakers. Now I wonder why the russet colour on a cat is called ginger, when he clearly should be called rusty?